City Palace Complex in Jaipur which represents a huge part of the city consisting of gardens, mansions and other buildings. Mubarak Mahala which is also known as the Palace of Welcome, has a gallery of musical instruments, textiles and national costumes. Silek Khana or the Hall of Arms which is situated behind Mubarak Mahala, offers to see inlaid with diamonds golden guns, poniards and Indian clubs. In other buildings of this complex tourists can see statues of elephants, ancient scrolls, silver urns etc. 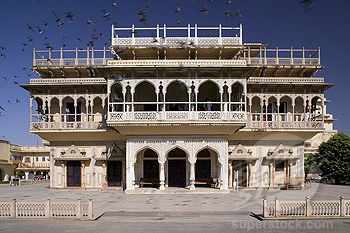 Palace of Winds or Hava Mahala is a unique example of architecture. This Palace, built in 1799, reminds a treasure casket. 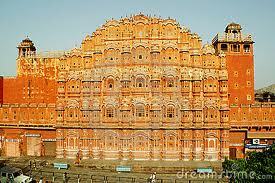 Maharaja Sawai Pratap Singh asked the architect to build an unbelievably beautiful Palace for the harem of his wives. As a result, there appeared a building with 953 small windows (in each room) and winds wandering inside due to unique ventilation system. Agra Fort build of red sandstone in 1565 seems uninviting, but in the inside it treasures up verily paradisiac corners of far ben. The most impressive inside buildings include Jihangir Palace, Khaas Mahal, Shiish Mahal or Palace of Mirrors, a mosque, halls for public and private audience, etc. 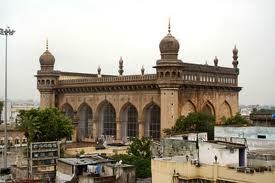 Mecca Masjid Mosque – one of the biggest and oldest mosques in India that was built in XIV -XV centuries by Mohammed Kuli Kutab. It has a huge pool in the yard and huge columns and arches made of black granite. The history of this mosque is full of old legends and mysterious stories. 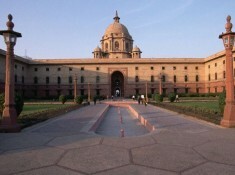 Rajput, also known as “The way of Kings”, is a boulevard in New-Delhi that ends at the National Stadium. 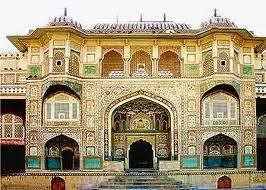 On the other end of Rajput the Palace of President is located. This Palace is considered to be one of the most beautiful buildings in Delhi as its style is a combination of European and Mogul architectural thought. Every winter Rajput holds parades on 26 of January. Amber Fort which stands on the hill and admires its reflection in the waters of Moata lake is considered to be one of the best forts in India. Tourists are offered to ride an elephant to get to this fort inside of which they can find lots of souvenir-shops, visit Shila Devi Temple, beautiful palaces or the Hall of Pleasure and see a lot of wild monkeys. 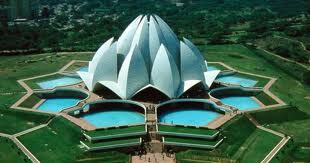 Lotus Temple in Bahai reminds a real white lotus. It is one of the newest Temples in Bahai which is situated in wide picturesque park and is surrounded by 9 pools. Lotus Temple is made of white concrete and white Greek marble. 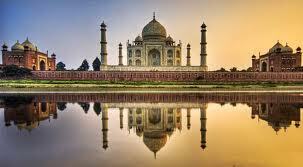 Taj Mahal – the Mausoleum of Mumtaz Mahal, the wife of Shah Jihan. The mausoleum made of white marble is a true masterpiece of architecture. Its impressive interiors with dreamy decorations remind of touching love story with a tragic end. 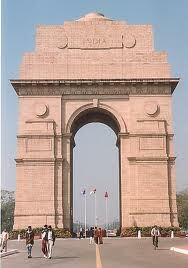 India Gate – a stone arch-memorial with a quenchless flame built in honor of Indian warriors who died during World War I. Over 90000 names are carved on the surface of the arch. 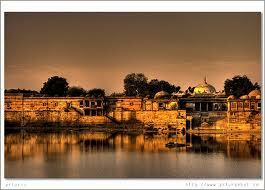 Sarkhej Roza – one of most picturesque places in Ahmedabad. It represents a huge complex with a mosque, kings’ graves, ecclesiastics’ memorial and Summer Palace. It is believed that the beauty of the sundown met here will be never forgotten. 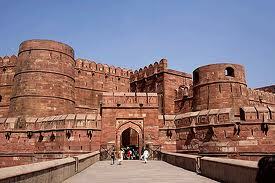 India welcomes all tourists to see its beauty and touch its treasures.